Moment of Clarity – Why Being in the Trough of Sorrows is a Good Thing. You encounter these sort of questions when you’re in the “Trough of Sorrows” (as Paul Graham so eloquently stated). Being in the “Trough of Sorrows” is a good thing. These sort of questions often stand between entrepreneurs and a full night of sleep. The questions build an uneasy tension that resides just below the surface, often concealed by a fragile ego. There seems to be pressure in the startup community to keep a stiff upper-lip and not admit any weakness. These questions mixed with slowing sales or other obstacles can lead you right into a feeling of helplessness. You can very easily get stuck in the “Trough of Sorrows” where nothing quite seems to be working the way that it should be. It can be a ridiculously hard thing to break out of, but most entrepreneurs have had to go through it at one point or another. The first time I experienced the trough of sorrows, I dreaded every second of it. It’s not a fun position to be in. The second time I had to go through it, I had a change of heart. My Moment of Clarity came to me when I was at my lowest point. Sales were drying up and growth was becoming stagnant. I looked at my bank account and wrote out the tiny balance on a piece of paper. I figured out that we were going to run out of money in 6 weeks. The trough forced me to take a step back and take an objective look at our strategy. I realized I could either be depressed about the number, or let it fuel me. You see, the trough of sorrows is a metaphorical fork in the road. You can either fold up shop or you can persevere. There is no middle ground. It’s almost refreshing to have a black and white outcome for once. If you can make it through the trough, you’ll be able to conquer any other situation. When you’re in the trough your instincts will tell you to fold, but if you’re sure of your business (after taking an honest look at it), that’s your cue to and double down. Do whatever it takes to make things work. Since I knew exactly where we stood, I became fierce. I was determined to not let my company die. I went into overdrive and kept hustling until that tiny bank account doubled. Then it doubled again. And again. All of this happened because of my moment of clarity. I was no longer hostage to those poisonous questions and could see things clearly. Whenever you go through your trough of sorrows, know you’re not alone (almost everyone has gone through it). 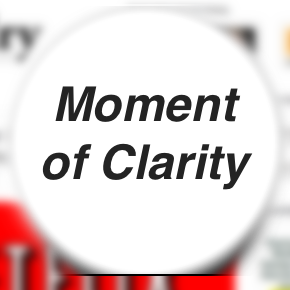 Search for your moment of clarity.